Background: Previous research has shown that external hemorrhage from proximal leg amputations and junctional sites represents 19.2% of potentially survivable lethal hemorrhage. A recent effort to address this problem has resulted in the development of various junctional tourniquets. This study assessed and compared two Tactical Combat Casualty Care Committee-approved junctional tourniquets, the Combat Ready Clamp (CRoC) and the Junctional Emergency Treatment Tool (JETT), to contribute to their future development and to better inform on the decisions for device selection by military units. Aims of the study also were to provide concrete feedback and suggestions on how to effectively apply the devices. 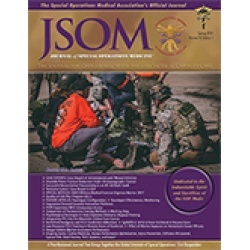 Methods: Via a specific questionnaire, 75 international attendees of the International Special Training Centre Medical Branch Special Operations Forces Advanced Medical First Responder course evaluated the CRoC and the JETT on different parameters. Both devices were tested objectively through timed applications aimed at stopping unilateral lower-extremity distal pulse on 33 of these 75 students, verified by palpation by Medical Branch instructors. Subjective and objective data were examined for mutual correlation. Results: Users ranked the JETT higher than the CRoC on all parameters, including effectiveness on the battlefield (ρ < .001), ease of use (ρ < .039), speed of application (ρ < .001), and not slipping in use (ρ < .001), although the difference on other parameters such as effectiveness in hemorrhage control was not statistically significant. Considering all parameters together, the JETT was evaluated as a better device than the CRoC (ρ < .001). The application time measurement suggested that the JETT was applied faster (by approximately 15 seconds on average; p < .001). The fastest CRoC and JETT applications were 37 and 29 seconds, respectively. The JETT was not easier to use or more effective than the CRoC; there was a 9% failure rate of the JETT occluding a unilateral common femoral artery. The JETT's efficacy in occluding a unilateral common femoral artery can be compromised if the device's pelvic binder is not sufficiently tightened prior to threading the T-handled pad. The CRoC's application time can be drastically reduced if the device is kept assembled and firm pressure is immediately asserted upon placement on the intended location through the vertical arm, then threading the device. Both devices were applied safely; no adverse effects were reported during or after application. Conclusion: Even though the JETT might be preferred by military medical providers, the CRoC still has merits. As both devices proved to occlude the arterial flow in no less than 54 seconds on average, they could be used to supplement direct pressure and wound packing, the latter two still being considered the immediate actions for inguinal bleeding control. Considering that the CRoC and the JETT can be applied in as little as 37 and 29 seconds, respectively, users should be effectively trained and entirely proficient on either device to justify their election as the primary countermeasure to hemorrhage not amenable to regular tourniquets.